Join the LUK Mentoring Team for the Rodman Ride for Kids on Saturday, September 22nd! You can join us as a rider in Foxboro, but you can even participate from home as a virtual rider! As a virtual rider, you can join the team and, instead of riding, raise money while doing your activity of choice, such as running, walking, swimming, or other activity. 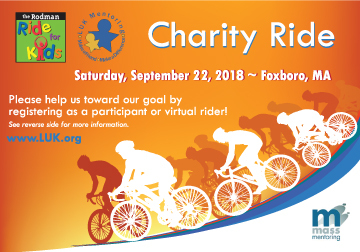 The Rodman Ride is a non-competitive 25, 50, or 100 mile cycling event to raise money for the Rodman Foundation, which supports kids’ charities in Massachusetts. All funds raised by the LUK team will support the LUK Mentoring program. For more information about the Rodman Ride, visit mmp.kintera.org/2018/LUKMentoring. For more information about LUK Mentoring, or to become a mentor, visit www.LUK.org/Mentoring, email Mentoring@LUK.org, or call 800-579-0000.